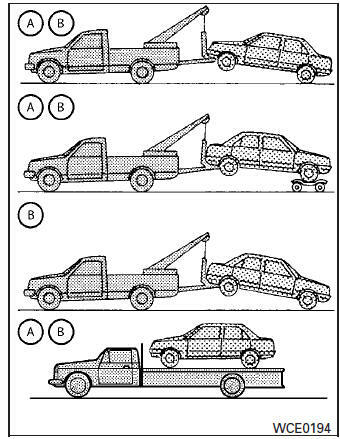 NISSAN recommends that your vehicle be towed with the driving (front) wheels off the ground or place the vehicle on a flat bed truck as illustrated. Never tow Continuously Variable Transmission (CVT) models with the front wheels on the ground or four wheels on the ground (forward or backward), as this may cause serious and expensive damage to the transmission. If it is necessary to tow the vehicle with the rear wheels raised always use towing dollies under the front wheels. Place the ignition switch to the OFF position, and secure the steering wheel in a straight-ahead position with a rope or similar device. Never secure the steering wheel by placing the ignition switch in the LOCK position. This may damage the steering lock mechanism (for models with steering lock mechanism). Move the shift lever to the N (Neutral) position. 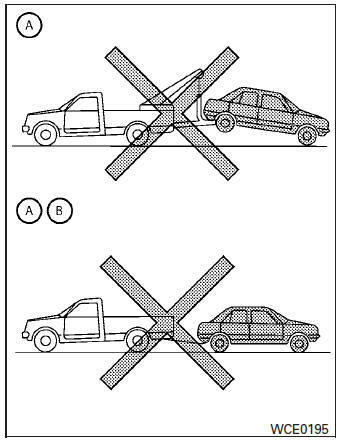 When towing Continuously Variable Transmission (CVT) or manual transmission models (M/T) with the rear wheels on the ground (if you do not use towing dollies): Always release the parking brake.